The History of Robert Barron was dealt with in The Lock Collector issue No. 8 of July/August 2005 and it mentioned that Barron's revolutionary lock patent was No. 1200 dated 27th February 1778. Robert Barron's invention took the existing single tumbler principle a giant step forward and destroyed the long held supremacy of the protective ward system. Although Barron incorporated wards in his locks to comfort those who believed that they continued to provide good security. 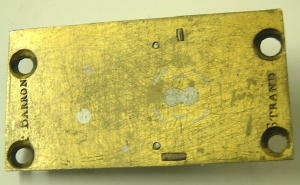 His locks had two tumblers (as they were called then, but from roughly 1820 were called “levers”). They were each fitted with a projecting stump. The key had to lift these to a precise height so that these stumps could pass through a gating cut out in the bolt – the bolt could then move through the stumps to open or close the lock – see the photos below. 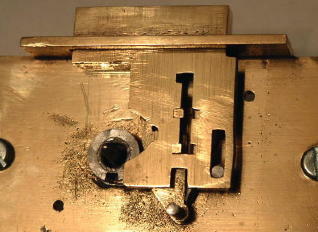 This basic mechanical principle was carried forward even in modern day locks; however the stumps were later placed on the bolt rather than the levers, and of course to provide greater security more levers were added. 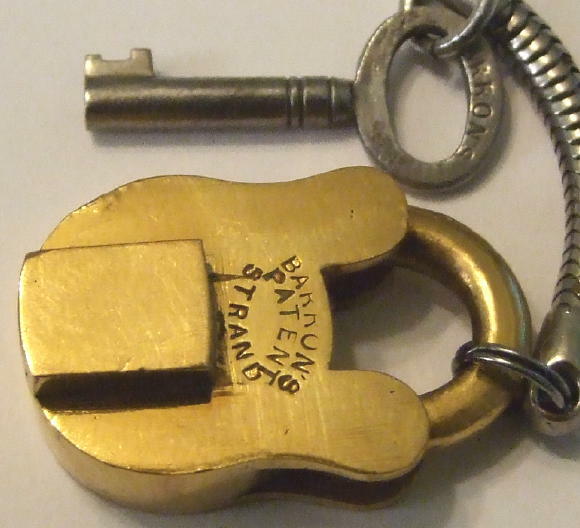 The above padlock indicates the address of Barron at the “Strand” where the family business was originally at No. 475 there in West London. It became No. 476 Strand in 1796 and was changed to No. 479 in 1829 (then from 1833 onwards 436 Strand, possibly due to street re-numbering). Two brothers, Francis and Robert Barron took over the family business of braziers and ironmonger after their father died in 1763 operating as Francis and Robert Barron, Braziers and Ironmongers, Strand”. Francis seems to have moved elsewhere in 1769, but re-appeared after Robert was married and left the firm in 1776 to live at Bowling Green Row at Hoxton in Shoreditch. 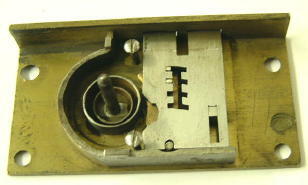 There his new lock was developed and the patent obtained. From 1781 Robert moved to No. 66 Barbican in the City of London, but just before his death in 1794 he lived at 75 Wood Street off Cheapside. Meantime his brother Francis continued to trade in the Strand, and took his son into partnership, becoming Francis Barron & Son in 1792. Doubtless his business was held in high public esteem, since in 1790 he was listed as Ironmonger and Brazier to the King! As so little is known about the Barron brothers and how the business relationships were conducted it has not been practicable to ascertain whether they worked together while they were apart. Perhaps it was the case that Francis manufactured his brothers locks at the Strand address since the lock below of 1790 is marked “F. Barron, Strand” and has the Barron Patent mechanism. An additional difficulty due to the lack of information, is to date these locks with any degree of accuracy. A rough guess about the padlock's age is to suggest roughly 1800, and if that is the case it has survived in remarkably good condition. 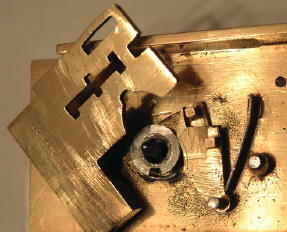 It is a miniature lock just slightly over one inch (2.6cm) high x 0.7” (1.8cm) wide. Maybe a collar for some aristocrats dog at that time? This article is © Tony Beck, 2007.